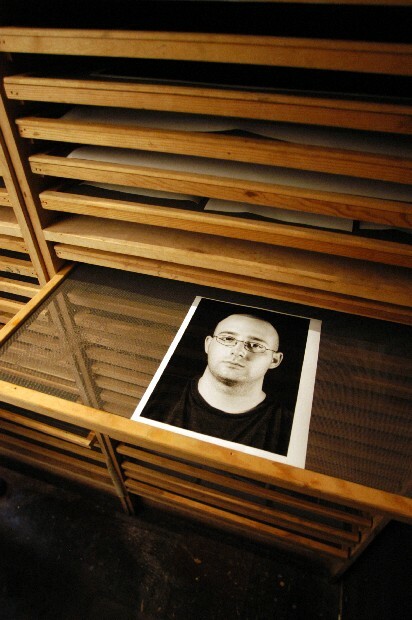 This is one of the photos for my studio lighting class drying in the racks in the photo studio at the Corcoran. It is a contemporary portrait, a well done mug shot. I'm happy that I've been in the photo lab developing 4x5 negatives and printing photos in the darkroom. This drying rack has a look and style that calls to mind the Zen feeling that comes from working in the darkroom. I hadn't recalled how simple and wonderful it was to watch an image appear on paper like magic in developer. I am happy that all of my prints are now finished. Now I start on the digital prints.